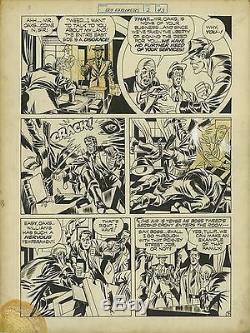 Joe Simon & Jack Kirby (1946) Boy Explorers #2 pg 43 Original art. This 1946 Joe Simon & Jack Kirby page featuring some hard-boiled gangster action was intended for. #2, but was left initially. When the issue was pared down to a much smaller "subscriber only" format. Published in the 1987 edition. From Pure Imagination and then again in 2010 in Titan's. The Simon and Kirby Library #[nn] - Superheroes. Though initially unpublished, this piece from the Vagabond Prince story "Trapped in Wax" remains a fine example of the 1940s collaborations of one of comicdom's greatest creative combos. Joe Simon and Jack Kirby are one of the most well-known duos to ever work in comics. Their historic output as a team began early in the Golden Age and includes the creation of Captain America and Bucky, the Boy Commandos, the Guardian and the Newsboy Legion, the Fighting America, Boy's Ranch, the romance comics genre and so much more. After their partnership ended, Kirby, of course, would go on to create most of the Marvel Universe and is considered by many to be the greatest comic book artist who ever lived. This is large, twice-up art with an approximate image area of 12" X 18". The item "Joe Simon & Jack Kirby (1946) Boy Explorers #2 pg 43 Original art! RARE" is in sale since Thursday, November 17, 2016. This item is in the category "Collectibles\Comics\Original Comic Art\Interior Pages". The seller is "thejudge01" and is located in Port Coquitlam, British Columbia. This item can be shipped to United States, Canada.